Wells, Lorraine Schreiner 70 of St. Paul, Minnesota, surrounded by love and light, left her body on February 10th, 2018. As she moved forward, in an unexpected final moment of selfless love and generosity, her departing spirit provided profound comfort to her grieving son as he held her hand. Most recently, Lorraine was a loving and committed Nana to her grandchildren Lily and Joe, an avid Yoga practitioner, a tireless advocate of social justice and equality, a committed volunteer to the Como Zoo, and lover of the ocean and nature. 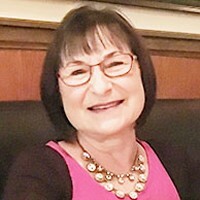 Lorraine was born in Queens, New York to Lillian and Joseph Schreiner. She was raised on Long Island, New York, and throughout her childhood spent summers on the north shore of Long Island in Rocky Point, a place she described as "heaven on earth". She graduated from Seaford High School in 1965 and attended Parsons School of Design in New York City. It was there she refined her skills and cultivated her love of illustration and design, one of her many lifelong pursuits that she executed with beautiful precision. After Parsons, Lorraine moved to Kansas City, Missouri where she worked at Hallmark as an illustrator. Lorraine married David Kelsey Wells Jr. on September 18, 1971, and they gave birth to their only son, David Kelsey Wells III. In 1980 She began her successful corporate career with Johnson Controls in Milwaukee Wisconsin, which led to numerous promotions and a relocation to Chicago in 1984. Lorraine was frequently recruited by multiple corporations within her field - often by executive leadership, a testament to her abilities and her highly respected reputation among her peers. Lorraine's lifelong passion for the arts, her deep abiding faith in a universal spirit of unconditional love, appreciation for nature, and identity as a Mother and Nana were all paramount to her. She excelled in all of them. She is survived by her son, David Kelsey Wells III, (Wren), grandchildren Lillian Madelon Wells and Joseph Lawrence Wells, sister Carol Pizzini, (Pierre), niece Michell Pizzini, nephew PJ Pizzini, and countless friends. A celebration of life will be held on March 10th, 2018 from 4pm to 8pm at the Como Zoo in St. Paul. Two additional celebrations will occur later this year, one in New York, and the other in Hawaii. In lieu of flowers, memorial gifts are requested to the Como Zoo and GiveMN in honor of Lorraine Wells.